Tropical Upholstery specialises in exceptional quality upholstering solutions for furniture, cars, boats and more for both residential and commercial clients. We can take an old lounge suite back down to the frame, repairing it if need be and build it back up in the same style or make it more modern to suit your needs. Using quality foam and filling and offering you a wide range of fabric samples to choose from. Whether it is an antique lounge suite or your kitchen chairs, we’ve got your upholstery needs covered. At Tropical Upholstery we can get your shade project off the ground, from design through to completion. 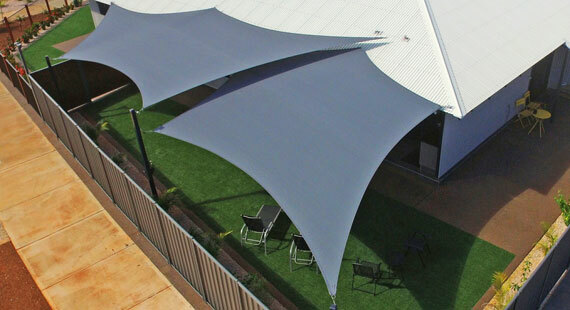 We only use the best products available with the “Coolaroo” 95% commercial grade shade cloth and marine grade stainless steel fittings and cable. All our shade sails are made here in Broome with our local conditions in mind and we are available to help you with any advice you may need. 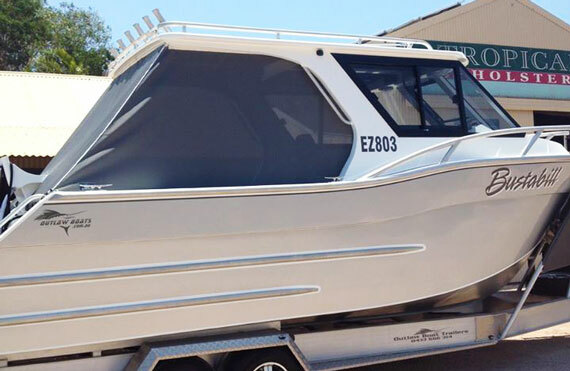 We can help make your boating more comfortable with custom made cushions and upholstered seats to canopies and shade covers. We can manufacture collapsible canopies including the framework or have solid structures made to your specifications. Engine cowling covers are one of our specialities along with storage covers. And for the professional fishing industry we can manufacture fender covers, aprons, lifting bags and drogues. So come in and see us or phone, fax or email us for an obligation free quote. If your car seats are looking a bit tired come and see us, we can make them look and feel like new. We specialise in canvas seat covers manufactured to suit any model. At Tropical Upholstery we can also manufacture canopies and tonneau covers. 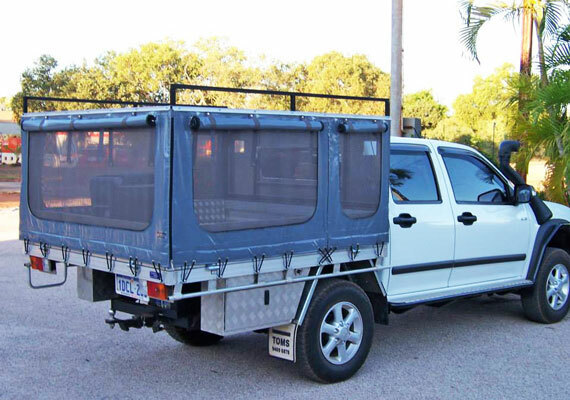 We are agents here in Broome for Rhino roof racks, and can fit your car out with a Quickshade to keep you and your family out of the sun. Swags come in lots of different sizes and styles. Here at Tropical Upholstery we have two tried and tested styles, each in three different sizes or we can custom make one to your own specifications, using quality canvas and foam mattresses. We can build you a custom designed camper trailer or refit the canvas part of your pop top camper. We can supply you with awnings and tarpaulins to make camping and caravanning more comfortable. We are agents for Kenlow, which means that we can help you with annexes, retractable blinds, window awnings and the latest in retractable shadesails.